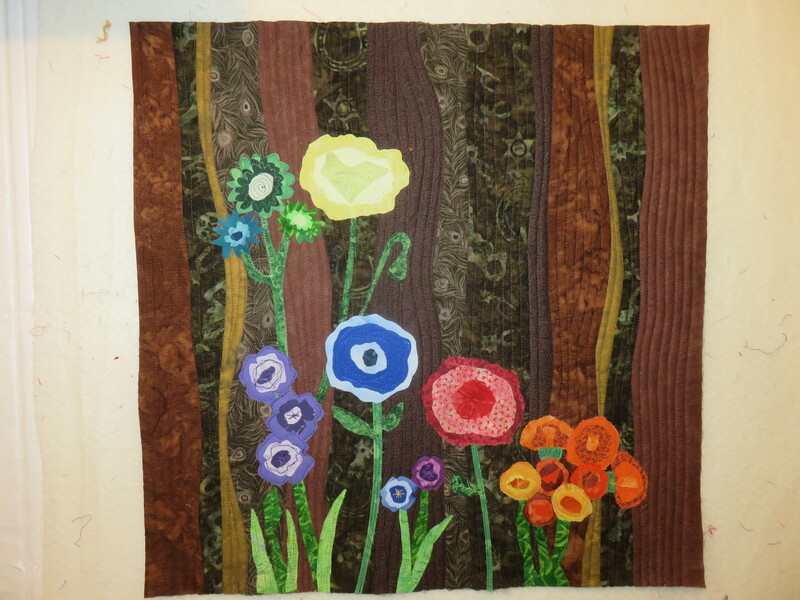 The first finished project is a small (20”x20”) wall hanging that I completed in one week as part of a challenge series. 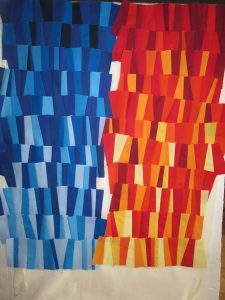 The challenge of this one was to use 6 rich browns as well as 36 colours based on a 12-step colour wheel – that is, 12 hues with a tint and a tone or shade of each hue. As an added challenge, the project was to have some reference to the colour wheel. 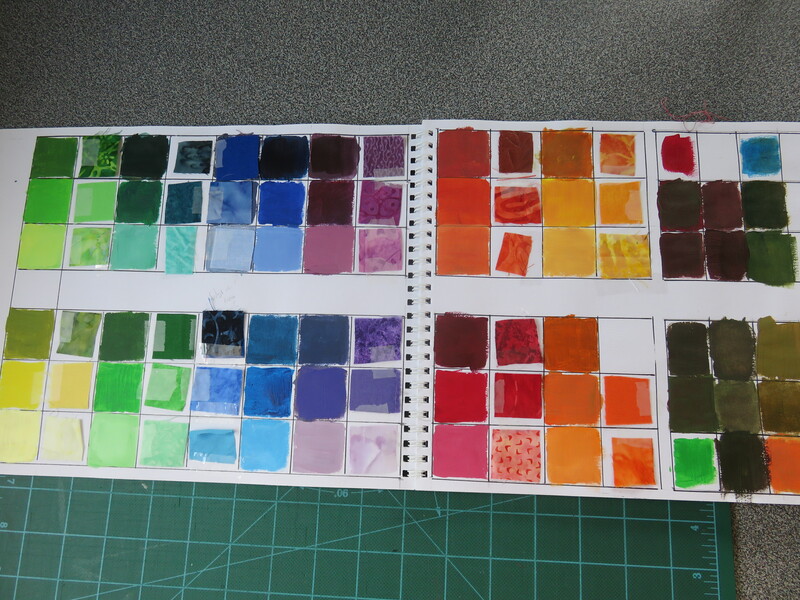 I started by taking out some acrylic paints and mixing colours to create a palette for the project. 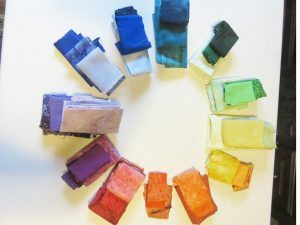 I created a palette with acrylic paint then selected fabric swatches to match. Using the results of that experiment, I moved to collecting all my colours. Although I took more time than I would have liked to find the full range, I did manage to do that using materials at hand. 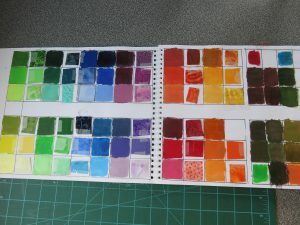 I incorporated some of my hand-dyeing experiments but I’m still at the playing stage on that and not yet getting the control I would like to do a full colour wheel – not yet, that is. My original thought for the design was to go with something abstract while I was out taking some pictures in the garden, I noticed that with a shallow depth of field (blurred background), I could see various browns in with the greens in the background. As a result, I decided to go with a representational garden. My finished Colour Garden. The 6 browns are clear in the background. I used gentle curves and simple straight quilting in the background because I wanted the look of wild flowers at the edge of a woods. To meet the criteria of reference to the colour wheel, I made the primary colours the largest, the secondary colours smaller and the tertiary colours still smaller. I used a flat facing to the back rather than a visible binding. This was a fun little project. I’m making a class from this one. In that post, I indicated that I was still playing with warm and cool colour strips, deciding how to assemble them. I included this picture to show my progress with the strips. I started making all my strips mixed colours but decided that I wanted to do them with a spectrum of [mostly] light to [mostly] dark. When I placed the strips all on the table together, I was immediately reminded of a sunset. That was it – no way that I was able to take it in another direction so I went with that idea. 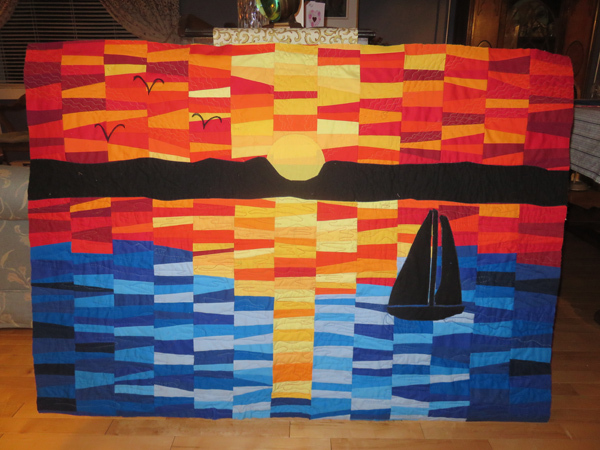 I wanted to have the sky light reflected in the water so I created a land mass as a horizon line 1/3 from the top and put some of the warm red, yellow and orange strips below the land then quilted to represent ripples in the water. I couldn’t resist adding a sailing boat because – well, I’m a coastal girl, after all. This is not a usual style for me but I am quite pleased with the result. What have you been doing with colour lately? Have you ventured into new combinations or tried a limited palette? Try looking at the world through rose coloured glasses – or maybe through red, green or yellow filters. You never know what new colours or combinations might inspire you.